IS THIS WEIRDLY UGLY OR AWESOMELY BEAUTIFUL? My mind’s eye has now thoroughly switched over to a symptom’s point of view. I almost feel I should capitalize the words — Symptom’s-Point-Of-View. What is so special about it? Frankly, it helps lift the veil off much of life’s mystery. The symptom’s point of view is more about how I make judgments in the world I experience. The natural way of judging the world simply mirrors the needs and fears of the person judging. Of course, all this occurs sub-cognitively. People aren’t generally self-conscious when they pass judgment on the world out there. For example, if I’m afraid of snakes, I’m more likely to judge snaky things as weird, ugly, bad, or even on a positive note, awesome and beautiful! Fear and need seldom link so directly to the judgments we make. For example, judging rich people “bad”, doesn’t mean one fears them, or needs money directly. Nevertheless, rich people represent some issue, however tangential, that originates in a detractor’s personal fear or need. Often, our fairness instinct triggers the negative bias toward the rich, (see PDF, Unfair Trade: Monkeys demand equitable exchanges). Such instinctive emotion overwhelms any wish we have for making fair and impartial judgments. There is a way around this dilemma however. Simply asking, “Why is ___ (you name it) the way it is” before ascribing any positive or negative verdict avoids falling into this subjective-parochial-bias-trap. For example, when I see someone behaving inappropriately, I ask, “What does he need or fear that drives him to such behavior?” This is incredibly liberating for the drama of judgment ceases drawing me into battle. My needs and fears can cease contending with their needs and fears. This corresponds to chapter 8’s, It is because it does not contend that it is never at fault. What’s more, viewing life this way, reveals more about how life actually is, rather than how I think it should be. 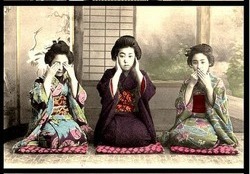 The symptom’s-point-of-view offers another way to interpret the ancient proverbial principle, “See no evil, hear no evil, speak no evil”. First, I can’t imagine anyone believing that nature in the wild is evil. Nature can be ruthless, but it is never ever evil. As chapter 5 observes, Heaven and earth are ruthless, and treat the myriad creatures as straw dogs. On the other hand, humans and the perception of evil go hand in hand. The only reason for this is that we perceive the world as it is, and compare it with our ideals of how it ‘should be’. Of course, our ideals of what ‘should be’ only mirror our own personal needs and fears. This battle between what is and what we think should be vanishes as we adopt a symptom’s–point-of-view. Try it and see if life doesn’t become much more peaceful and comprehendible. There is no why. There is only your self. The perception of “inappropriate behavior” arises in our own mind, not due to our needs and fears, but from our expectations of appropriate behavior. These norms are culturally determined, so if we view the behavior without the appropriate/inappropriate label, we need only deal with the consequences of the behavior, regardless of its source.